So we are finally feeling better in this house- although there is nothing like getting really sick to make you feel sooooo old!!! I mean seriously. It’s like when you get through the day and are exhausted and ready for Jammies at 4pm? And because it is getting darker so much earlier it’s even more tempting to hunker down. As soon as Seattle starts it’s rainy season forget it. We are talking sweats and hibernating 24/7. This fall feeling also puts me in the mood for comforting rich foods like braised beef- you too? I love to make a braised beef like this because you can make a base recipe and then spin it in so many different ways. This particular recipe was inspired by this café that opened up in my Queen Anne neighborhood in Seattle called Bounty Kitchen. It’s so good. I switch off and on between my two favorite dishes, one of with is a Forbidden Braised Beef Bowl for it’s rich braised beef and black forbidden rice. It is soooo good! Because I couldn’t stop thinking about it I had to try and recreate it at home. 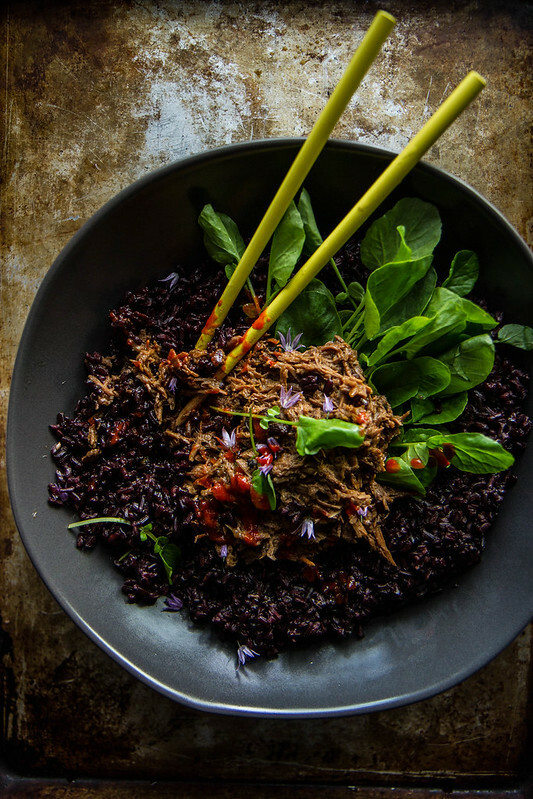 So I used a basic braised beef recipe and then added a delicious Asian inspired sauce and paired it with simple forbidden rice and fresh and peppery watercress. The dark unconventional colors are so beautiful and the flavors so rich and luxurious that this would be an amazing dish to serve at a dinner party (also because so much can be made ahead of time) but it would also be an awesome big bowl to cuddle up to on a stormy Sunday night too ☺ And if you can’t find black rice, then you could certainly swap it out for steamed rice- I would go with Jasmine! ****I know that this is not a printable format- I am dealing with a glitch in the system and will fix it ASAP! (optional) serve with sriracha for a spicy kick! In a large heavy pot over high heat add the vegetable oil. While the pot and oil are getting super hot, rub the beef top-round with the kosher salt. Sear the beef in the pot on all sides, letting each side get golden and crusty, about 2-3 minutes per side. (This should take about 15 minutes.) Add the onions in the last 5 minutes and let them fry in the fat. Add the beef broth and bring the broth to simmer. Put a lid on the pot and reduce the heat to low. Simmer the beef for 4 hours over lowest heat, flipping the beef half way through to get even cooking. When the beef is very tender and falling apart, remove it from the pot and transfer it to a baking dish. Continue to cook the liquid in the pot, uncovered on low heat. Remove the string if there was any and any visible fat or gristle. Shred the rest of the beef and then add it back to the pot. Bring the heat up to medium-high and cook for another 15 minutes, letting the liquid thicken. Meanwhile make the sauce. In the jar of a blender combine the garlic, brown sugar, sriracha, tamari and 1 cup of the broth that the beef is cooking in. Puree until smooth and then add it back to the beef. Season the beef to taste with kosher salt. At the 3 hour mark with the beef, make the rice. In a medium sized pot combine 6 cups of water and 3 cups of black rice with 1 teaspoon of kosher salt. Bring the rice to a simmer over medium-high heat and then put a lid on the pot and reduce the heat to low. Let the rice steam for 40 minutes or until just tender and the liquid has all been absorbed. Season the rice with kosher salt to taste and put a lid on to keep hot until the beef is ready. 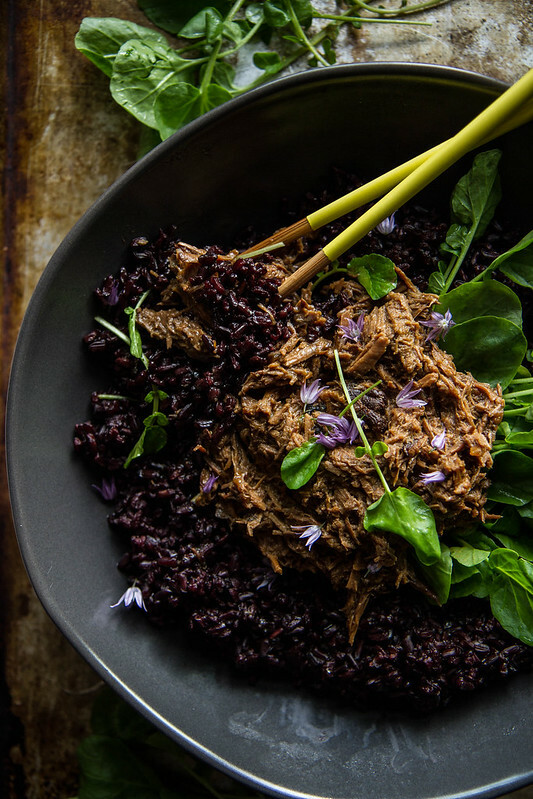 To serve: Pile a generous scoop of forbidden rice and top with a handful of fresh watercress and then scoop the braised beef on top. Enjoy hot. I love that forbidden is in the title. It makes it so much more intriguing! I’m glad you guys are all feeling better!! I love forbidden rice, and until recently, never knew how nutritious it is. 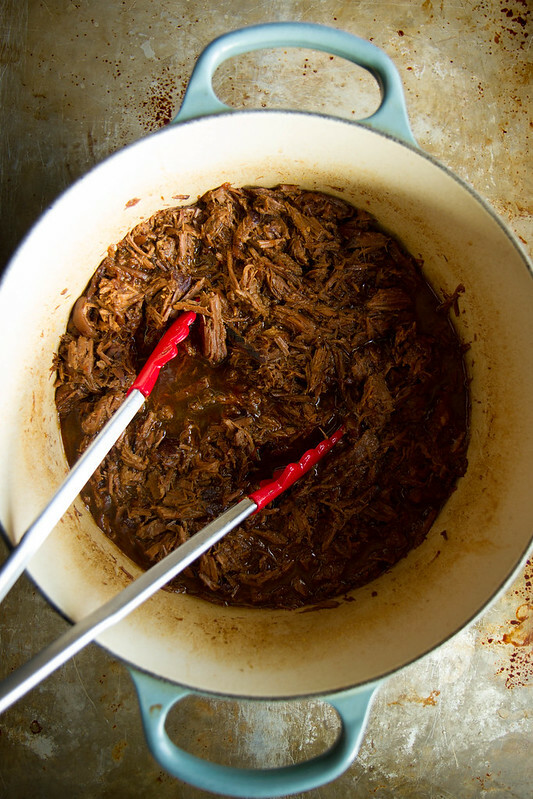 I haven’t made it with shredded beef before…loving all the flavors you have in here Heather AND how easy it is…think the whole gang is going to enjoy a big bowl of this! Thanks Jessica- i actually didn’t know that it was super nutritious- I am excited to hear that! I love the forbidden rice. It’s so under used, although it’s pretty popular in Asian cultures, but you never actually seem to find it in Asian restaurants. That said, I love that you highlighted it here. I have never heard of forbidden rice and now can’t wait to try it. 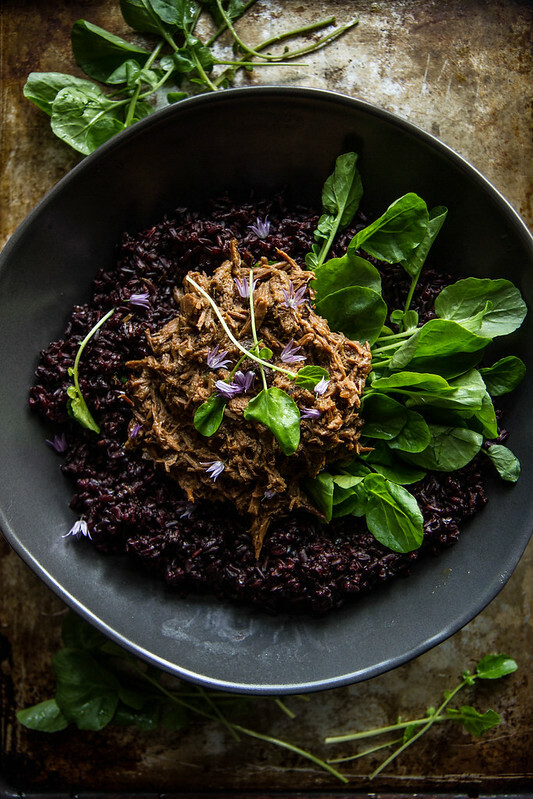 This braised beef bowl sounds delicious – certainly perfect for all this fall weather! Beautiful! Tessa- it is the black long grained rice- it is not only a cool color but has a wonderful nutty flavor! I hope you try it- it is always fun to find new great ingredients! Love the name of this dish!